Position a loaded barbell on the rest of a preacher bench. Sit on the preacher bench and lift the barbell off the rest using a shoulder-width underhand (supinated) grip. Rest the backs of your upper arms on the padded surface, with your elbows fully extended. Exhale as you curl the barbell upwards, towards your shoulders. Inhale as you lower the barbell until your elbows are fully extended. Adjust the seat to ensure that your upper arms, from armpits to elbows, lie flat on the padded surface of the preacher bench. Keep your elbows in line with your shoulders. Keep your body still. Only your forearms should move. 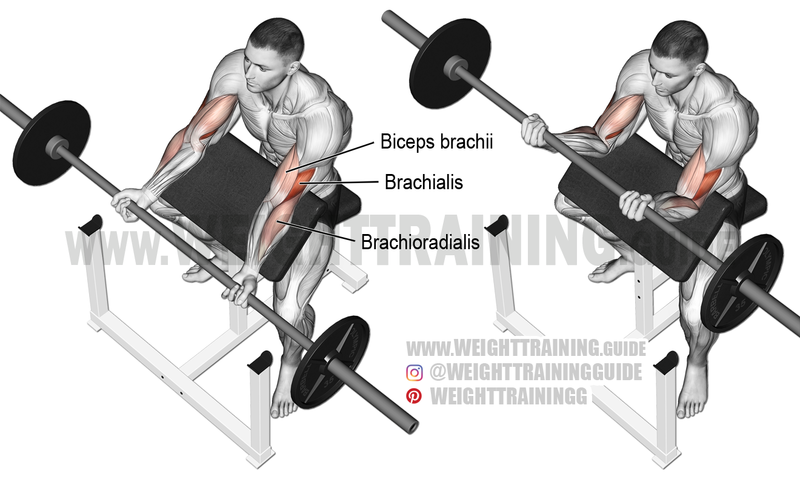 When you perform the barbell preacher curl, the short (inner) head of your biceps brachii enters into active insufficiency (i.e. develops slack) at the top of the curl, Therefore, the long (outer) head of your biceps brachii is activated more than is the short head. Using an EZ bar might be easier on your wrists. See also the cable preacher curl and the dumbbell preacher curl. The EZ bar is used in this video demonstration.